Mike is a native Hoosier, having been born in Indianapolis and raised in Vincennes, Indiana. 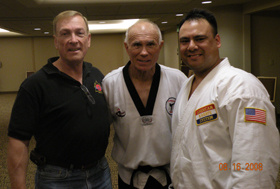 Mike is the Chief Instructor of the American Karate System, and a member of the AKS Board of Advisors.He started his martial arts training at the age of 12 in 1960. 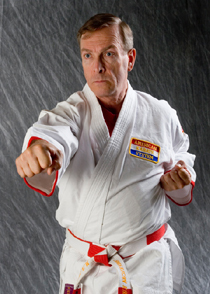 Over the years Mike has studied Judo, Jujitsu, Hapkido, Shotokan, Issinhryu, Chung Do Kwan Tae Soo Do, and Tang Soo Do Mu Da Kwan. He joined Mr. Lieb's organization in 1972 and was one of the 13 orginial schools/instructors who assisted in founding the AKS. Mike continues to be a steadfast supporter of the AKS and its goals to this day. In the above picture, taken shortly after Mike had reported to his new duty assignment in southern Spain, we find him executing one of his rare jump flying side kicks. Because Mike has always been stocky and muscular, one of his first instructors, Mr. Dennis Callahan, had told Mike, "elephants don't fly." As that seemed to be somewhat of a challenge, Mike worked on a few jumping kicks just to be able to say, and demonstrate, that anything is possible. 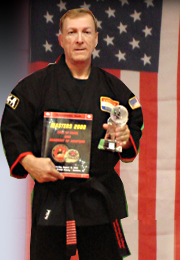 Mike competed in his first tournament, as an under black belt competitor, in May of 1966 in Jhoon Rhee's championships in Washington DC winning his first three matches before a one point loss. 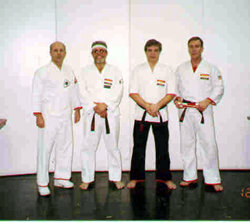 He participated in his last competion in Germany in April of 1987 walking away with a black belt senior forms trophy. Over those 21 years he managed to win more in black belt forms than in fighting, though he managed to hold his own in that event. 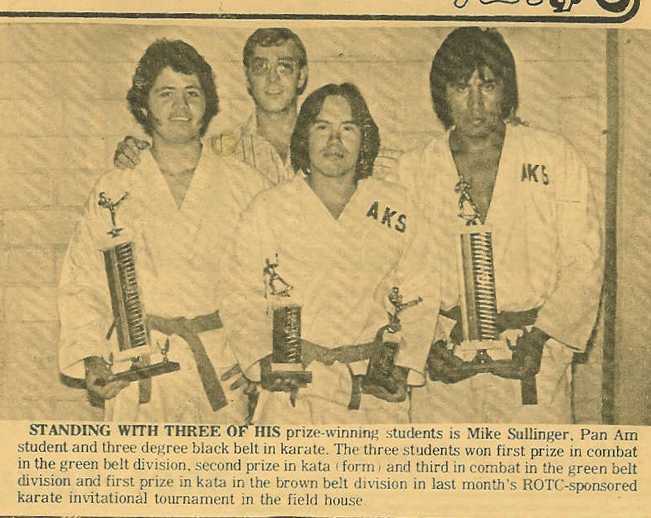 During his first competion as a black belt, having just returned from Spain where he'd earned his 2nd Dan in Tang Soo Do Mu Duk Kwan, Mike competed in Kang Rhee's Memphis Tennessee Karate Tournament in November of 1970. He won first place in heavy weight sparring and third place in the black belt grand championships, having risen to the top over such top competitors as Fred Wren, Steve Smith and Parker Shelton. During the 1973-74 time frame, while living in South Bend Indiana, his winning streak in forms was such that he was the top forms competitor for the AKS and the number two forms competitor for the AKA. It wasn't unsual for him to depart from a weekend competion having won first place in forms and somewhere between first and third in fighting. The picture on the left was taken at the University of Texas - Pan American field house in November of 1975 during the first of two tournaments Mike ran on behalf of the Air Force ROTC detachment. 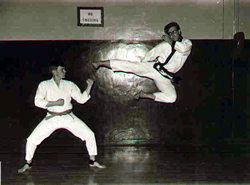 In this picture Mike is executing a step across side kick through 5 one inch boards. Look closely, you won't find any spacers between those boards. 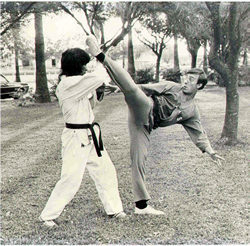 In the picture on the right, Mike is caught in mid execution of a a hook kick to one of his students, Candelario (Candy) Arteaga, in the park at Edinburg Texas where Mike conducted classes from 1974 through 1976. Mike was an airman during the Vietnam time frame (10/66 to 10/70). 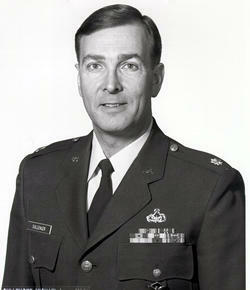 During his first assignment at Sheppard AFB in Whicita Falls, Texas, he met and married the former Maria Juanita Lara. He and Janie (as she likes to be called) were stationed in southern Spain in the city of Sevilla. It was here that Mike began teaching classes in karate (Chung Do Kwan)at a local Judo school. 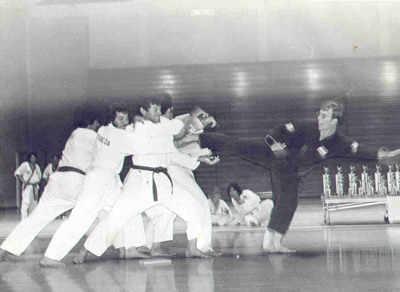 Mike's karate classes were the first to be taught in Sevilla in the middle 60s, and possibly the whole of southern Spain. 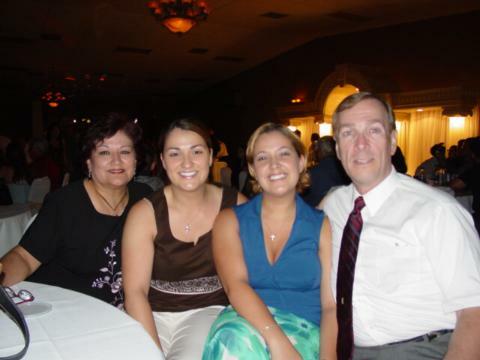 After being discharged from the Air Force, Mike and Janie went back to the states and stayed at her parents home in south Texas where he began attending Pan American University and working fulltime as a police officer. He also started the first karate club at the university. 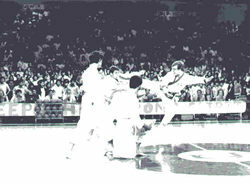 In the above picture Mike is seen executing a spinning back kick through several boards during the half time of one of Pan American University's seasonal home games. This was in the spring of 1972, just a couple of months before Mike returned to Indiana to help a friend open a karate school in South Bend, Indiana. It was later that same year Mike and Ernie met for the first time. In the picture on the right Mike is teaching one of the many classes that took place in Rohden and Hessisch-Oldendorf, Germany during his first assignment there. 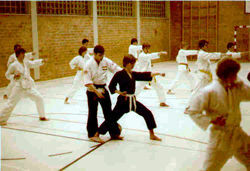 It was these first classes that set the stage for the eventual establishment and recognition of the AKS by the German Karate Union (known as the DKV). After graduating from the university with a BS in Criminal Justice Administration, Mike received a commission in the Air Force as a 2nd lieutenant and returned to active dury as a Security Police officer. During the next 16+ years Mike was stationed in Oklahoma, Germany (twice), Illinois (twice), England and Alabama. He continued to train and teach at each of these locations. His first assignment to Germany in 1979 sewed the seeds that resulted in today's AKS presence and recognition by the German Karate Union of the only non-oriental karate system, the AKS. 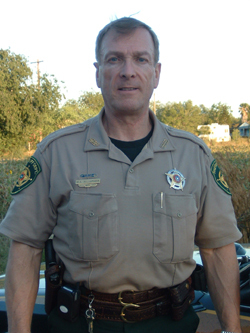 During many of his assignments Mike conducted classes for law enforcement officers (both civilian and military) in "come along" tactics and techniques, and the principles of "use of force" doctrine.From 1971 to the present, Mike has been involved in law enforcement. During the 16 years he was a commissioned officer he was also involved in various levels of security, to include physical security, industrial security, counter-terrorism planning and preparations, personnel & VIP security/protection, and operations security. Mike and Janie lived in Europe during much of the period when anti-American sentiment and terrorist attacks were mounted against the U.S. presence there. Mike has been on three different major command staffs (2 Air Force & 1 Army) and has been a chief of police twice and an assistant chief three times. Mike and Janie retired from the Air Force in June of 1993 and took up residence in the lower Rio Grande Valley of South Texas. This allowed Janie to be close to her parents for the first time in more than 16 years. 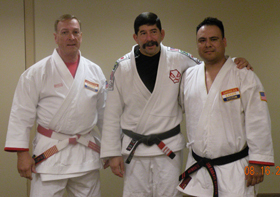 Since retiring to South Texas Mike has continued to teach and work with martial artists striving to improve their knowledge and abilities. From 1994 until 1999 Mike was responsible for authoring and publishing the AKS newsletter "The Punchline." In April of 2000 Mike launched the AKS web site. The reaction to the site has been promising and rewarding. Both old and new students have found their way into membership with the AKS. Mike also continues to author articles of opinion and insight for the The Punchline. In addition to these areas he also runs a counsulting firm for small businesses in a variety of areas of management, supervision and security. 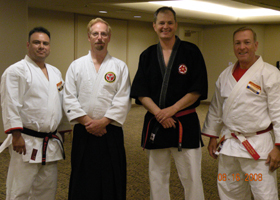 Above are the two black belts Mike has promoted over the years who've remained loyal to both the AKS and their friend and instructor.Pictured above left, Mike and J. D. "John" Hunt stand after JD was presented his 2nd Dan in Karate, which also included his membership in the AKS. This took place on the occassion of Virgil Perkin's (6th Dan AKS) final sparring blow out in Carmel, Indiana, on a Saturday morning in September of 1991. JD thought he was going to meet Mr. Lieb and some of the other senior black belts in the AKS. 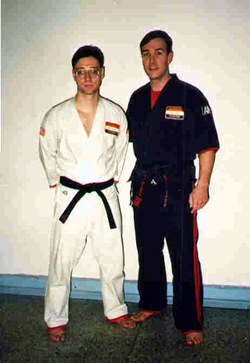 He had no idea Mike had set up his review for black belt and assimulation into the AKS.The picture above right is Mike with his senior student, Rob Debelak. 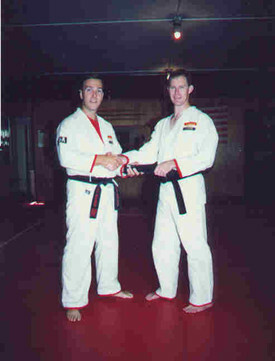 Rob started with Mike in Germany in early 1980, eventually earning his black belt in the AKS and taking over the Hessisch-Oldendorf Karate Club. It was through Rob that contact was initially made with Andreas Modl, a black belt in Wado Ryu who became Rob's student and leads the AKS in Europe today as the System's director. JD has also played a key role by working with Mike to compile and publish the AKS' first official student handbook. He and Mike are currently working on an updated newer version for the new millenium. It's students like these two who make all the efforts and hard work that goes into teaching worthwhile. There are a lot of instructors who can boast having numbers of black belt students, but few can say they have students and friends as loyal and as good of friends as Mike has with Rob and JD. They have both been blessings to him. The above newspaper clipping is from May of 1975. Pictured from left are David Aguilar, myself, Joe Gonzales, and Candelario Arteaga. Today, David Aguilar is the Chief of the U.S. Border Patrol. He had earned his brown belt with the A.K.S. and would have tested for his black belt had he not reported for training as a federal agent with the border patrol. Pictured above are (from left to right) Ernie Lieb 10th Dan, Dr. Guesslar Normand 6th Dan, Virgil Perkins 6th Dan and Mike on the occassion of his 6th Dan test in Toledo Ohio, December of 1991. Ernie had kept it quiet that he intended to review both Guesslar and Virgil for their 5th Dans at that time. That morning, before going to the Toledo YMCA where Guesslar had been teaching classes for several years, the two unsuspecting gentlemen enjoyed a healthy breakfast, while Mike kept it light as he was anticipating several hours of rigorous review under Ernie's ever watchful and critical eye. Suffice it to say it was a long morning for a couple of well fed black belts. 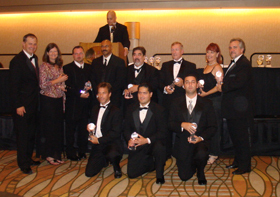 In August, 2008, in recognition of his untiring commitment to the martial arts community and his superlative teaching effectiveness, Major (USAF ret) Michael A. Sullenger AKS Chief Instructor, 9th Dan was inducted into the Master's Hall of Fame at the Anaheim Hilton in Riverside, California. He was also awarded the "Golden Lifetime Achievement Award" and was named a "Founding Member of the Academy of Masters and Masters Hall of Fame." 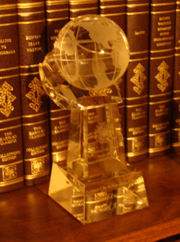 Along with that award, the American Karate SystemSM is now a founding member as well. 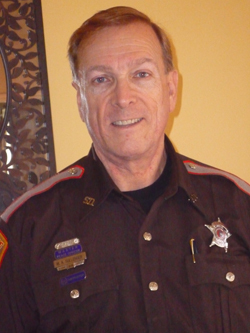 Since retiring from the Air force, Mike has continued in law enforcement with the Willacy County Sheriff's Department, first as the chief jail administrator and later as a member of the reserve. He is currently the training Sergeant and Range Master for the Willacy County Sheriff's Department.Mike is also a member of the Cameron County Sheriff's Department serving as a basic deputy and trainer for Cameron County. Mike worked with South Texas Community College in McAllen as the director of a grant from the Department of Labor, while also teaching American and Texas government as an adjunct professor.When the grant ran out in December of 2000, he moved to the other side of the South Texas Rio Grande Valley to become a fulltime professor at Texas State Technical College, where he continues to this day. Mike's teaching responsibilities at TSTC revolve around American and Texas government. He teaches the aspects of the history and evolution of our country and the State of Texas, while also including examples and discussions about the differences of the early years with those of today. With the various arguments between the left and the right (liberal/socialists and conservatives) it makes for some challenging talks between those who claim beliefs on those respective ideals.Mike has also begun teaching karate classes at the college during the Fall and Spring semesters. His deputy sheriff responsibilities also took on a broader area of responsibility when he became the departments training and range sergeant for both reserve and active personnel. From left to right, my wife, Janie, my oldest daughter, Erica and her younger sister, Michelle. Hello ! from "The Sullengers' "